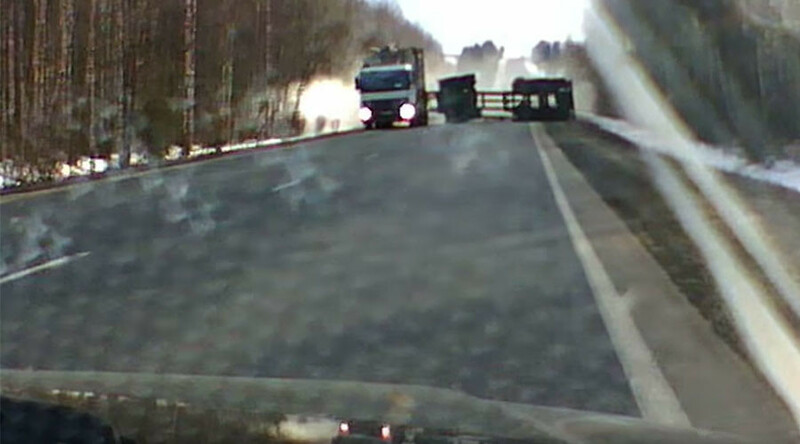 The heart-stopping moment a driver escapes a head-on collision with the trailer of an overturned timber truck on a rural Russian road has been captured on a dash cam video. The footage, published on Thursday, was filmed near the village of Vizinga, in northwest Russia’s Komi Republic. As the unsuspecting driver continues along the road, a pair of timber trucks with trailers appear in the distance. The first of the two vehicles drives past without incident, but the second isn't as steady, and begins to veer wildly. Still quite a distance ahead of the driver, the truck then spills its logs – due to what traffic police later said was a burst tire. The truck's trailer, losing its balance, then overturns. As the truck driver tries to brake, the trailer slides directly into the opposite lane, on course to collide with the oncoming car. The car driver desperately shifts into reverse, and for a few frantic moments sees the overturned trailer sliding right at him. The truck driver finally manages to bring his vehicle to a stop, averting what could have been a deadly collision. No one was hurt in the incident, but the spilled logs blocked the road for traffic, with the drivers then having to clear them themselves, according to media reports.